Why does the sinking of the Titanic hold such fascination for us? Many reasons have been advanced for the continuing fascination of this epic tragedy, but none, we think, can contribute as much to an understanding of it as the four accounts collected in this volume. All four authors were survivors, and each presents the catastrophe from his own viewpoint; the icy waters, the cries of the drowning, the confusion, and the heroism, are given an intensely personal immediacy. 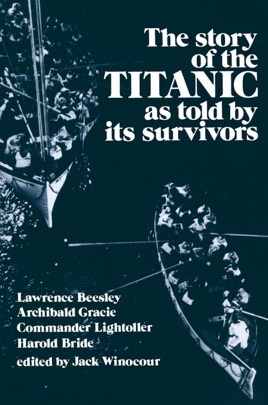 This volume contains, complete and unabridged, "The Loss of the S.S. Titanic," by Lawrence Beesley, and "The Truth about the Titanic," by Col. Archibald Gracie. Both are full-length books published soon after the disaster. Each has become extremely rare today. The third story in this volume, "Titanic," was written by one of the only officers to survive the catastrophe, Commander Lightoller. It includes the story of the "white-washing" inquiries into the Titanic's safety measures. The last section is a dramatic tale by the Titanic's surviving wireless operator, Harold Bride.